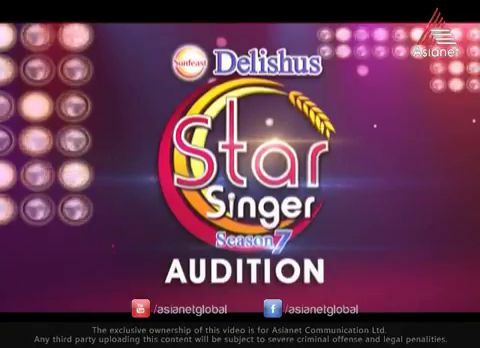 Star Singer Season 7 Audition On Sunday 16th February 2014 From 8.00 A.M Onwards. Age Limit Is 14 to 25 Years. Audition Venues are Kottayam, Ernakulam, Thrissur, Palakkad, Kozhikkodu, Kannur. Star Singer Is One of the Most Popular Musical Realiy Show On Asianet. Don’t miss this chance to Participate in Star Singer Season 2014. Title Sponsor Of Star Singer Season 7 is Sunfeast. What are the audition terms and conditions…?? why no audition in tvm. It is very happy to know that Asianet will going start star singer programme again.at the same time very sad to say that the time of andition is not suitable for lot of candidates in Kerala,because of this is the peak time for their exam study.I m wished to bring to her for audition.but can’t.her Xth exam will start 3rd Mar.I request you please arrange an audition after Mar 20. Sir, can u please tel me if the auditions for Idea start singer season 7 will be conducted on any future date too? I stay in bangalore and I came to know about the auditions yesterday night. If there are no future dates available atleast tell till what time today auditions will be there? So, please reply soon. It is urgent. SIr, Actually I have not registered myself in 2013 for Star singer season 7 2014 auditions for 14 – 25 agegroup participants. So can I directly go into auditions which would be organised on 23rd feb. 2014? And is it necessary to sing malayalam songs during audition? Can you just brief me about the song type, number of songs to be sung and desired language. Kindly reply soon. Yes you can come with Your Photo. sir my brother is 14 yrs old & he did’nt registered to season7…can he come for the audition @23rd this month directly and apply? plzzzzzzz need a reply immdietly….plz…..
No need, Just Photo Need.